2010 Ford E450 Horton Type 3 Ambulance. Is powered by a 6.0L Powerstroke Diesel Engine with an Automatic Transmission, has a 14050lb GVW, and a 158 inch wheelbase. The vehicle is PA state certified as a Basic Life Support Unit. This unit has the capability of transporting two patients. Various medical equipment is carried on board including oxygen, immobilization devices and a state of the art Automated External Defibrillator. Ambulance 54-2 is a 2014 Ford 450 4×4 Horton Type 1 ambulance, powered by a 6.7L Powerstroke Diesel engine with an automatic transmission. This unit was purchased as a demo ambulance from VCI Emergency Vehicles and is licensed as a BLS ambulance for the Commonwealth of Pennsylvania. 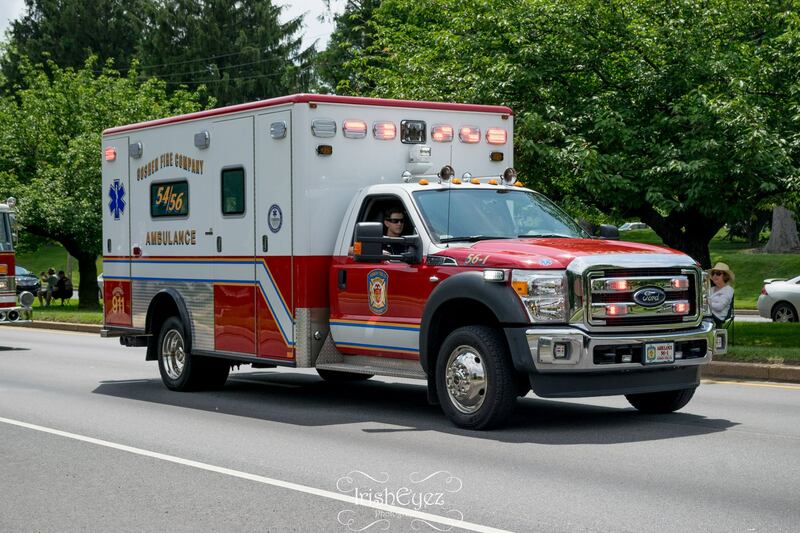 Ambulance 56-1 is a 2015 Ford 550 4×4 Horton Type 1 ambulance, powered by a 6.7L Powerstroke Diesel engine with an automatic transmission. 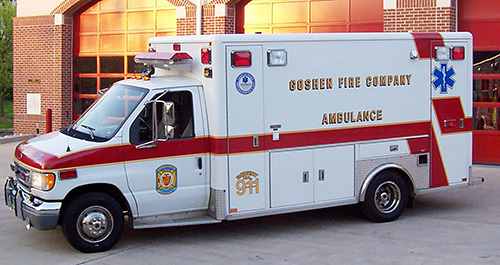 This unit was purchased from VCI Emergency Vehicles as a custom built to Goshen Fire Company specifications and is licensed as a BLS ambulance for the Commonwealth of Pennsylvania. 2002 Ford E450 Horton Type 3 Ambulance. Is powered by a 7.3L Powerstroke Diesel Engine with an Automatic Transmission, has a 14050lb GVW, and a 158 inch wheelbase. The vehicle is PA state certified as a Basic Life Support Unit. This unit has the capability of transporting two patients. Various medical equipment is carried on board including oxygen, immobilization devices and a state of the art Automated External Defibrillator.